Maintaining her usual high level of INSPIRATIONAL excitement, Club President, Om, opened today’s meeting…look at that contagious smile! Walter Want led us in today’s Pledge…Thanks, Walter! Announcements: Sign-up sheets were at each table for the various ways we can be involved with our Annual Auction…it is not too early to sign up…as this is our biggest fundraiser…and it will be held in the Cultural Center for 2019…which is a major change from last year’s event. 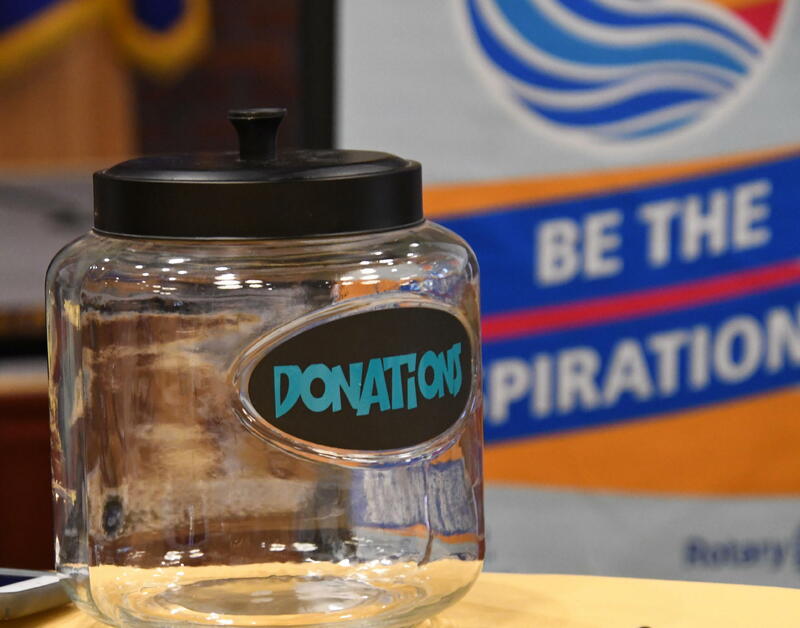 If we each do our part[s], the Club will be able to continue doing its part in supporting our community’s needs! Next week’s meeting, October 31 [Happy Halloween! 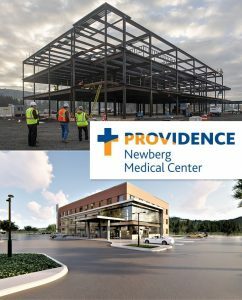 ], will be Bob Andrews, Mayor of the City of Newberg Saying Goodbye “Reflections and Roads Forward” the meeting will be at the Cultural Center. 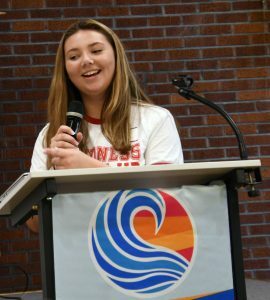 Leah reminded us again of the Christmas Tree Lighting Ceremony is scheduled for Dec. 1, 4:30 – 5:30 PM at the Cultural Center. That’s coming right up! Hopefully, we will soon get a more in-depth report on that morning’s festivities! It looks like a good time was had by all! 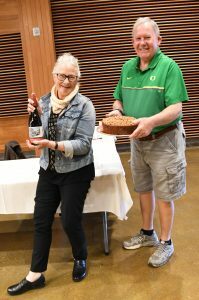 Instead of our usual DUCK routine, Becky Ankeny led us in a repeat of the “Cake Walk” activity from last week, but with a bottle of wine in lieu of a cake….and Mike Caruso started off with a $100 donation…into the Duck it went…and the “ante” was a suggested $10 this time, with all proceeds going toward Polio Eradication…so…nearly every space was covered, and Laura Tilrico won the bottle of wine! It is obvious that Newberg Rotarians know how to have F U N !!! 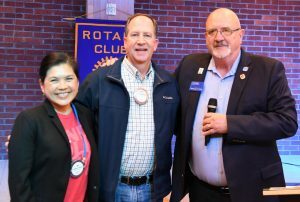 Today’s Program: A visit from our Rotary District Governor is always a treat…and today was especially so for Yours Truly, Editor Rick, as DG Larry Hatch is a long-time personal friend of mine…even before he was a Rotarian...as we both grew up in the Forest Grove area…and were both Charter Members of the Forest Grove DayBreak Rotary Club in 1991. So it was my pleasure to introduce our District 5100 Governor, Larry Hatch! D.G. Larry served as Club President twice, and was an Assistant Governor for three  years. 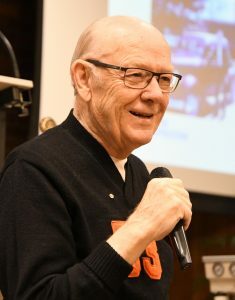 After serving in Viet Nam in the Army as a Military Police officer, he began a 41-year career in public safety. 13 years as a police officer and the last 28 years as the Assistant Director of Washington County 9-1-1 before retiring in 2015. 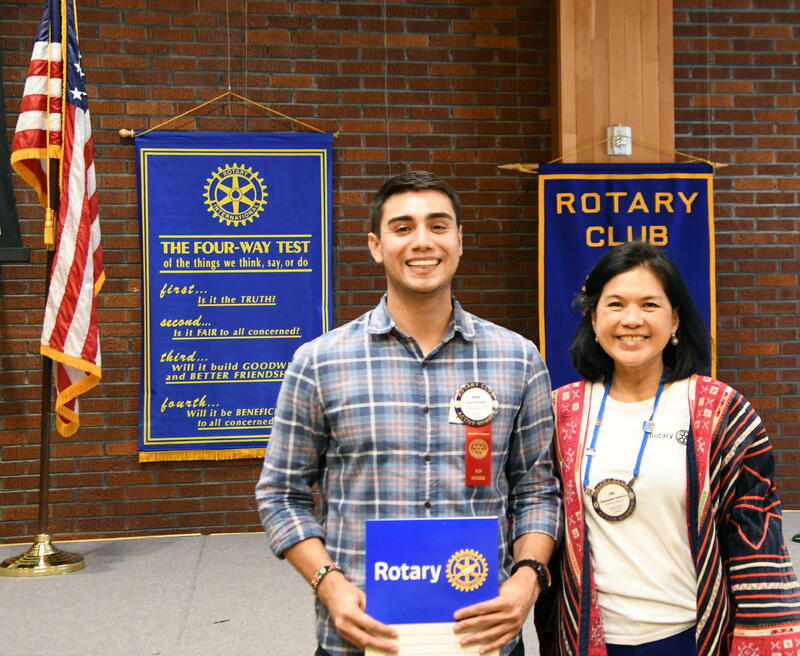 He believes we must all be global citizens and chose Rotary as his pathway for service. To that end he is a proud Rotary Foundation Triple Crown donor. Larry has been married to LaDonna for 45 years. 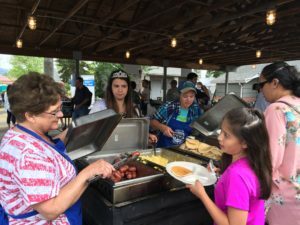 They live in Forest Grove and have one daughter, Christy, and a granddaughter Abbey. 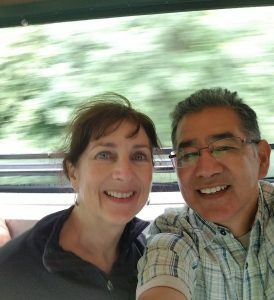 Larry and LaDonna are both retired and enjoy heading out in the RV to explore the backroads of Oregon and surrounding states finding unique places you can’t see from the highway. 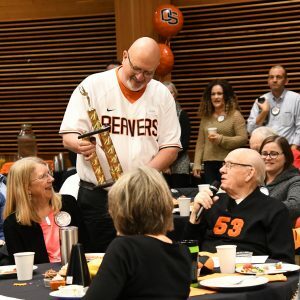 He is an avid sports fan supporting the OSU Foundation and all things Beaver. 1. She is a very fun energetic person who loves the “Mama Mia” movie. Of course, she can dance and have a good time with so many hats she wears for multiple tasks she takes on. All her work gets done marvelously. To work with her is just like lighting a Christmas tree. Warm and Joyful. Champion Leah Griffith. 2. He is a very competitive person. Winning is his motto. And he continues to bring victory to our community. He joins us together to build beautiful clean recreation parks. 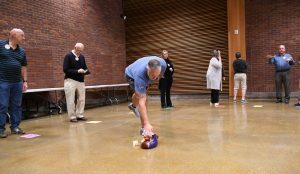 His final project before his retirement is a top notch Chehalem Aquatic Center. Champion Jim McMaster. 3. Speaking of innovation, being an extraordinary type, thinking outside the box, realistic, and communicates well with different age groups. Given his challenging personal life, he is always there to support us. 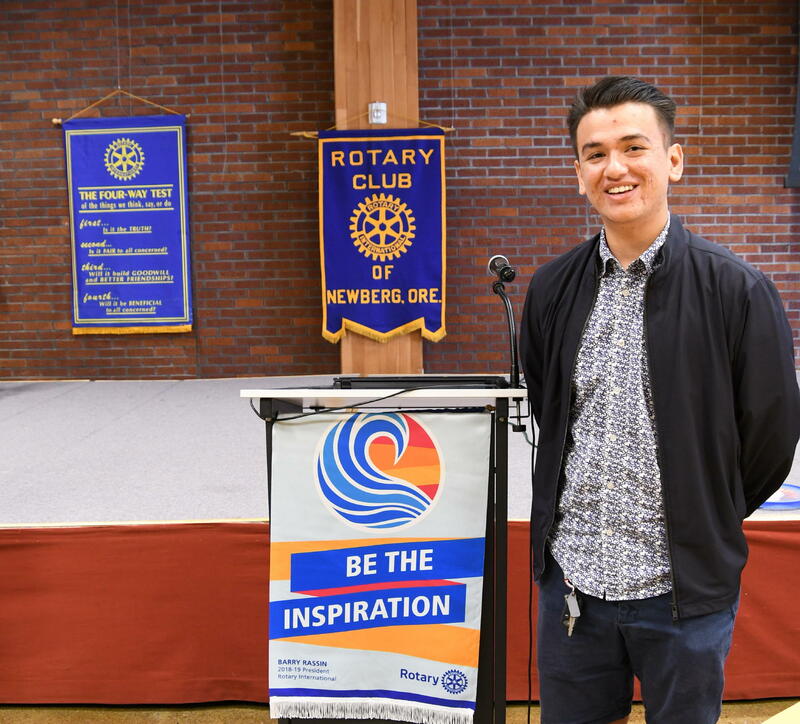 The latest mural project said it all about this capable Rotarian. Champion Geoff Gilmore. In turn, President Om presented District Governor Hatch with a bouquet of blue & yellow flowers…and a bottle of wine from Mike Caruso. 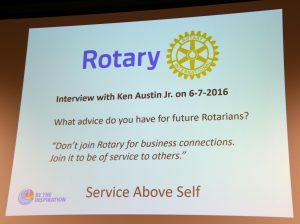 Thank you, District Governor Larry Hatch, for further Rotary enlightenment & encouragement! 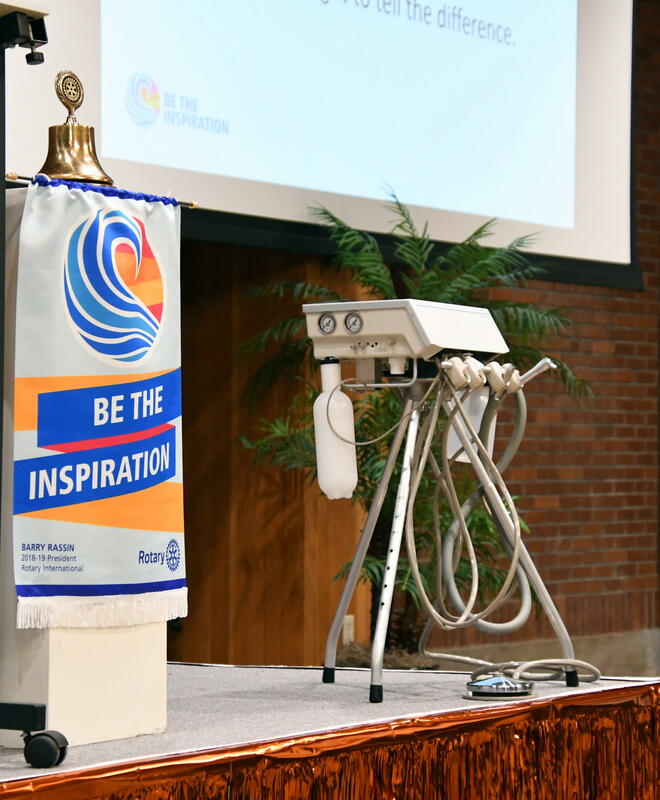 AND…we all are reminded of the date and location for the 2019 Rotary District Conference: May 17 – 19, 2019, at the “Riverhouse on the Deschutes”, Bend, Oregon…SAVE THE DATE! 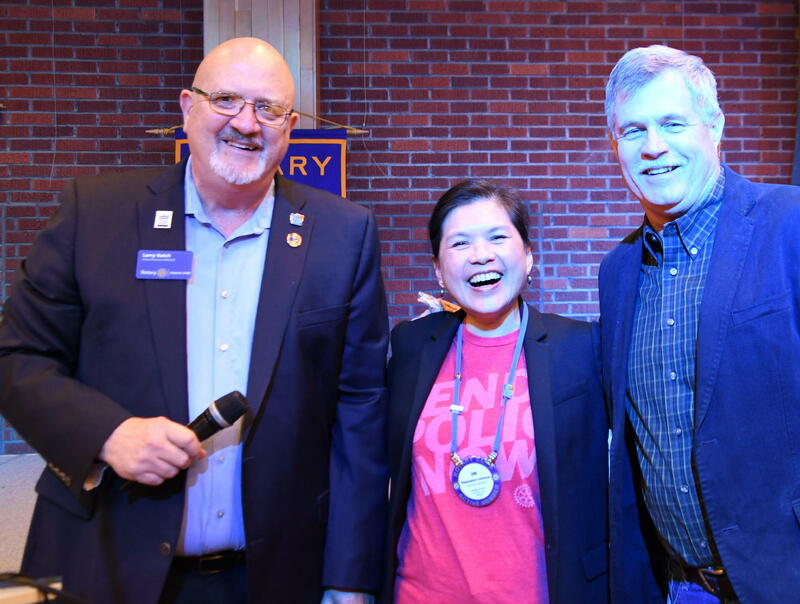 President Om had District Governor Larry close our meeting with the ringing of our Club’s Rotary bell! October is Rotary’s Polio Eradication Month….so here are some recent polio stats…. And a “BIG THANKS!” to Auggie for the terrific photographic coverages! 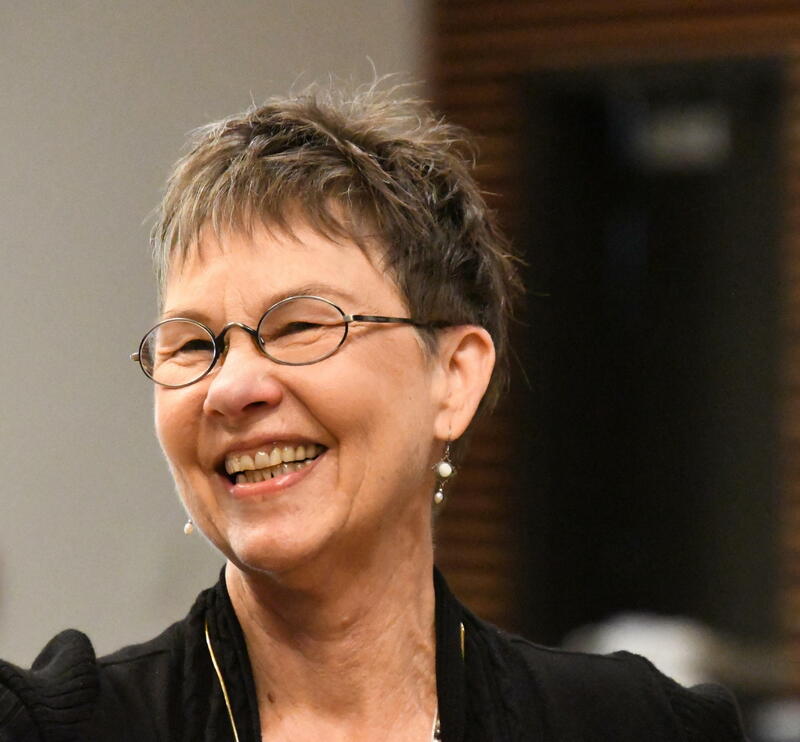 Beth Pent was today’s GREETER….Thank you, Beth! 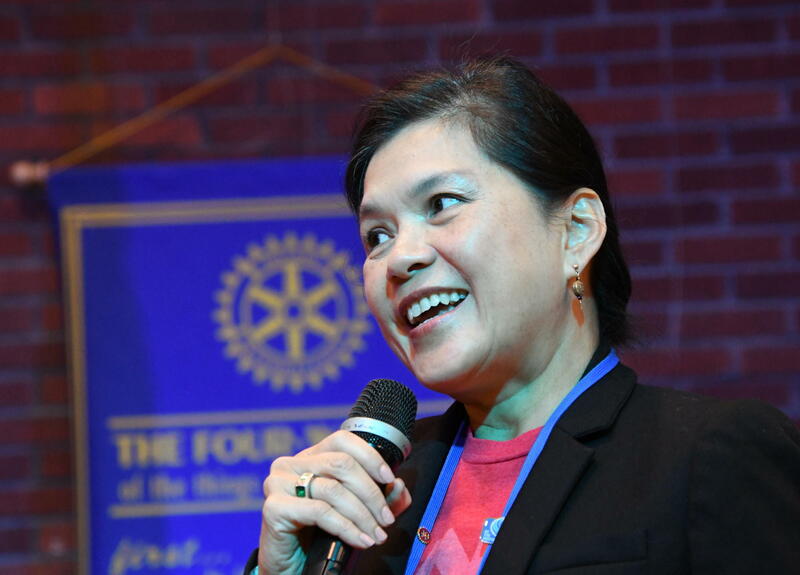 Club President, Om, opened today’s meeting…with her usual contagious excitement! Laura Tilrico led us in today’s Pledge…Thanks, Laura! Our one guest today was: Casey Kulla…guest of Walter Want. Welcome Casey! Yours Truly, Rick Kaufman, provided today’s Rotary Moment...remembering a particularly delightful Rotary meeting “make-up” in a large tent at the World Scout Jamboree in Australia in early January 1988. Globally, Rotary was [still is, I believe!] the largest single organizational sponsor of Scout Troops. Sitting next to me was a Scoutmaster from a suburb of Tokyo, Japan ….speaking with maybe a half dozen words of English…across from me was another Japanese [at least by his name & facial appearance] Scoutmaster…but wearing an Australian Scoutmaster’s uniform…and he told me that he knew maybe a half dozen words in Japanese …as he was third generation Japanese-Australian…speaking with a decidedly Aussie accent! The breakfast meeting of Rotarian Scoutmasters from all over the world was really F U N and very interesting. Attending the Jamboree were over 16,000 Scouts and leaders from 93 countries around the world. It was a real privilege to represent the Scout Council in our area. Jim McMaster: Son Spencer’s time with the Peace Corps in Africa is now being spent in “training”…with some very new experiences such as eating with one’s hands & “showering” out of a bucket. Leah reminded us again of the Christmas Tree Lighting Ceremony is scheduled for Dec. 1, 4:30 – 5:30 PM at the Cultural Center. Paula reminded us of Ken Austin, Jr.’s, birthday celebration 7 – 8:30 AM at the Cultural Center on October 25. Ken is a Past President of our club and was a Charter Member of the Earlybirds. Marge had a birthday card for us to sign for Ken. 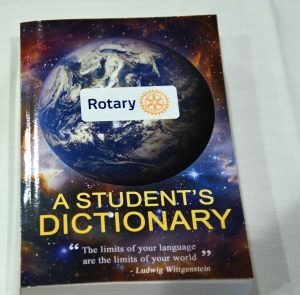 Tony L. reminded us that the DICTIONARIES were in…..ready to be distributed! Check with Tony if you can help! Steve Palmer’s wedding card was also passed around for signatures. No usual DUCK this week, per se, but hints at a fresh way to generate $$ dedicated to Polio Eradication were on the floor as we entered our usual meeting place…in the form of twenty  numbered markers. They proved to be “Cake Walk” markers! 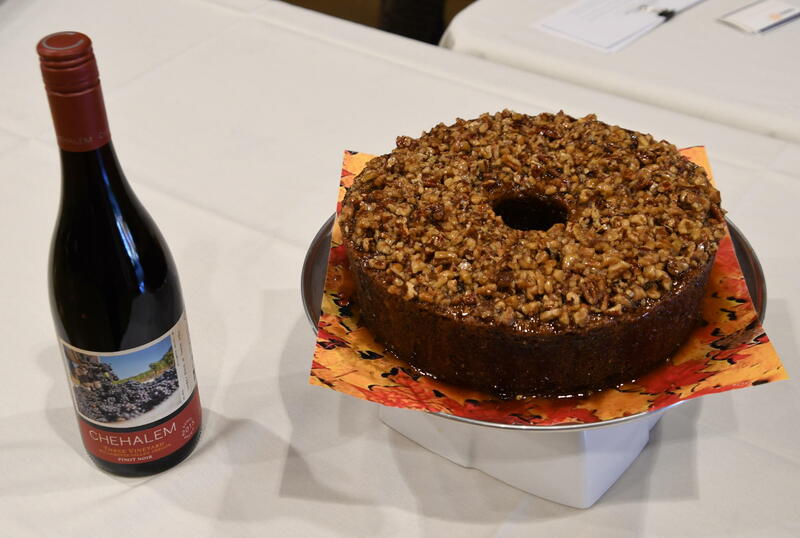 And the two prizes were a DELICIOUS cake and a bottle of wine. Most Rotarians’ dance “gyrations” were a bit….ummm…”low energy”…but Auggie more than made up for that with his highly energetic/entertaining “fast moves”….And as the Cake Walk participants went from number to number, with Paula at the music controls… they were encouraged to place contributions into the DUCK...situated on the floor in the middle of the activity…all proceeds to go toward Polio Eradication*. Spike, the winner of the cake, contributed it back to the club, having Beth Pent cut it up in small wedges which were then distributed to those present….and we can only guess as to Judy’s plans…. Auggie paid for the Univ. of Washington LOSS….in OVERTIME….to Oregon in a really exciting game! 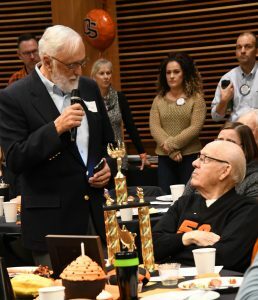 He also mentioned some new healthcare developments with Kaiser Permanente making a foray into our local healthcare scene…with further developments as they happen. 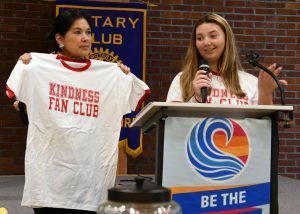 Introduced by Corey Z, today’s program underscores how important YOUTH programs and outreach are with a prime example of Carlie’s Kindness Campaign: “It doesn’t matter how old you are, you CAN make a difference!” Carlie Steele is now 14, but at age 9 decided to start a campaign “…in hopes of showing kids the importance of volunteering and spreading kindness! We do several projects for different causes and organizations…” Carlie was accompanied by her mother, Melissa Steele, who has been super supportive of Carlie’s efforts from the beginning. 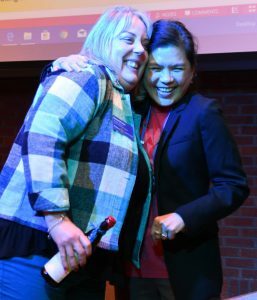 From their home in Amity, and through her 501c3 non-profit, Carlie has spearheaded many caring projects, a few of which are: Carlie Cares: Carlie’s Christmas for the Troops; Daily Point of Light; Vet Luncheon; Hurricane Harvey Drive; First Federal Diaper Drive, and many more! 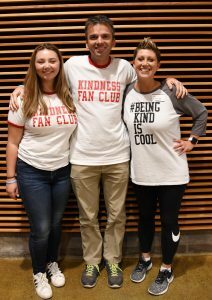 For more in-depth information on Carlie’s amazing efforts, check out her website at: carlieskindnesscampaign.org Her website is well worth the visit! 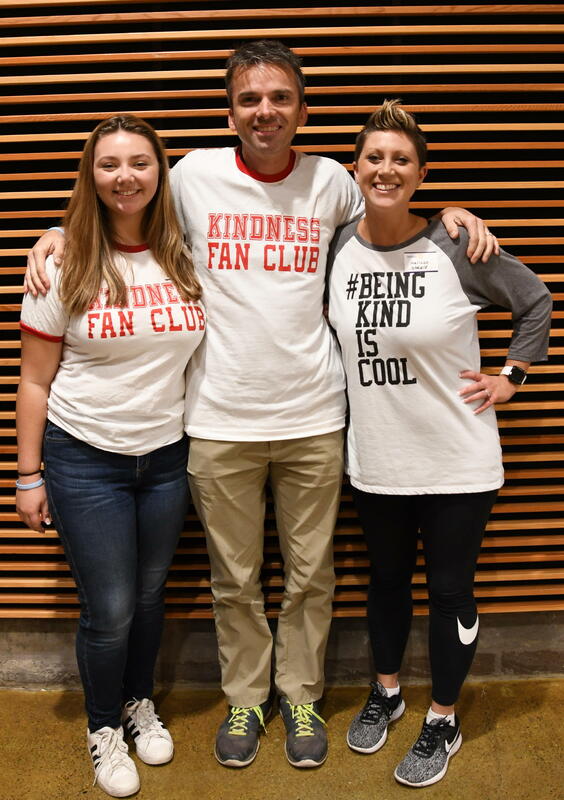 Funding support is provided by donations, sponsorships, grants, and selling of select merchandise such as the “KINDNESS FAN CLUB” T-shirt here displayed by Prez Om. 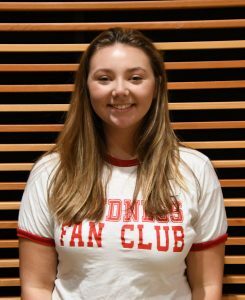 Carlie’s high energy and enthusiasm continue to drive even more successes that have resulted in NATIONAL recognition for her efforts. 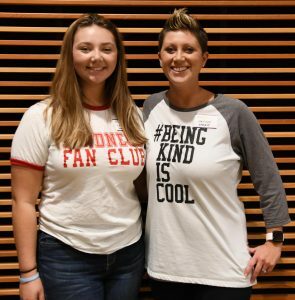 Additional “kindness” projects are “in the pipeline” for Carlie, her mom Melissa, and a growing cadre of supporters! THANKS, Carlie! 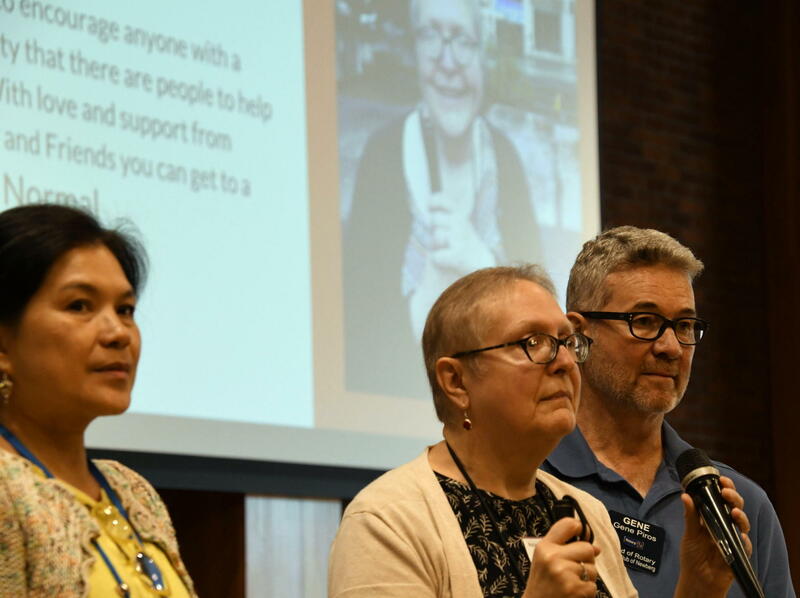 DON’T MISS THE OCTOBER 24, MEETING! District Governor, Larry Hatch, will be our speaker, and his message will be well worth hearing! 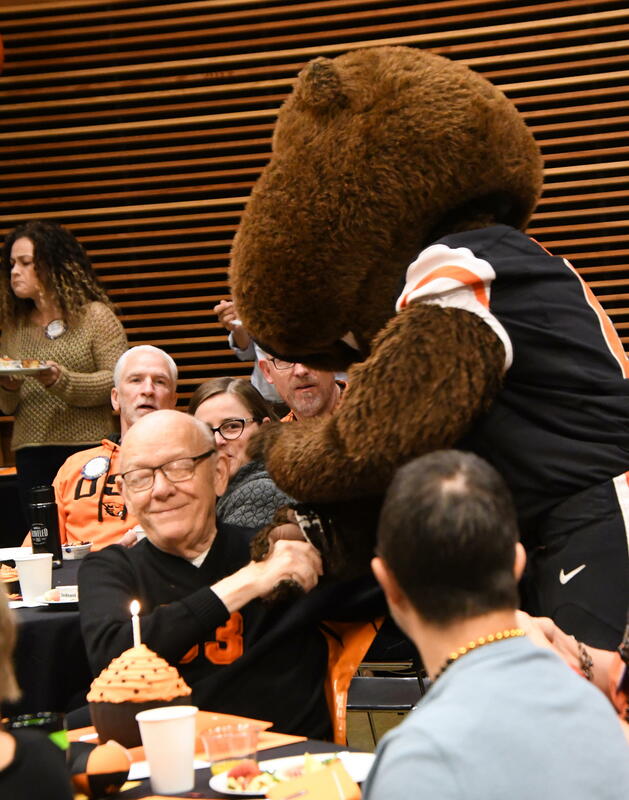 Once again, Prez Om closed with a very enthusiastic reminder to…. 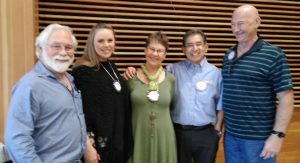 Editor’s note: Assisting me with the newsletter each week is a TEAM of Rotarians usually consisting of Beth Pent, Auggie Gonzales, Prez Om, Corey Z., and often with extra assistance from Walter, Leah, Geoff G., Jim McM, et al…..A “BIG THANKS!” to all! Laura Tilrico was today’s GREETER….Thank you Laura! 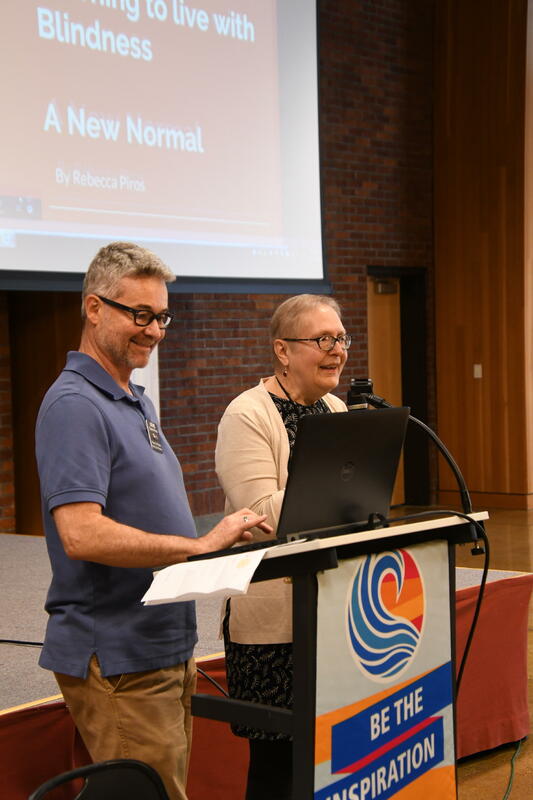 Immediate Past President Todd Engle led us in today’s Pledge…Thanks, Todd! 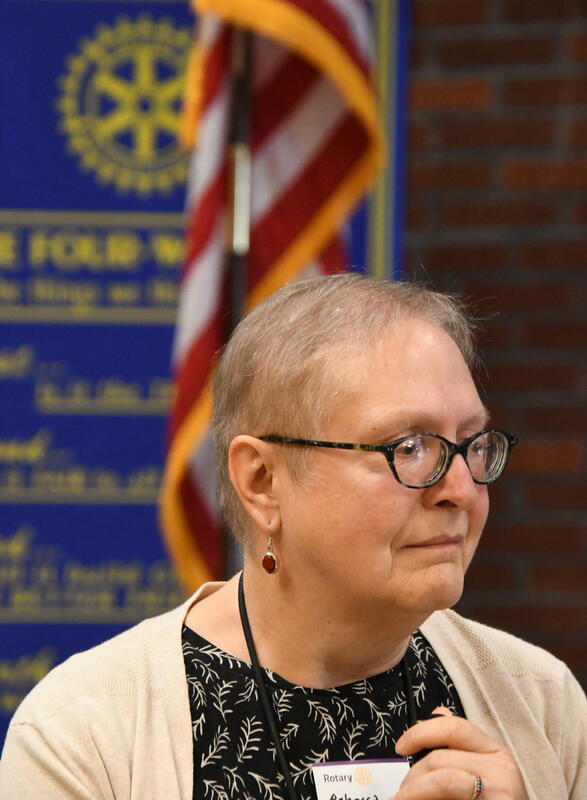 Deborah Cathers – Seymour provided today’s Rotary Moment... She highlighted her experience at the “Interrupting Hate” workshop sponsored by fellow Rotarian Becky Ankeny. 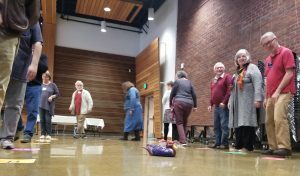 The workshop taught how to turn lemons into lemonade in difficult situations in which injustice is perpetrated against someone in public. The underlying assumption is that if we don’t transform our pain we are likely to transmit it to others. 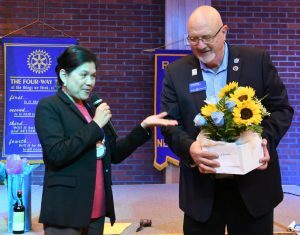 Deborah’s impression is that in general she and other Rotarians are fairly skilled at peacemaking and she went to the workshop thinking she probably already knew a lot about the subject. She was surprised and delighted to learn many excellent new skills. She expressed appreciation for the high value Rotarians place on learning and supporting peace-making. Thank you, Deborah. Curious as to what THAT is? 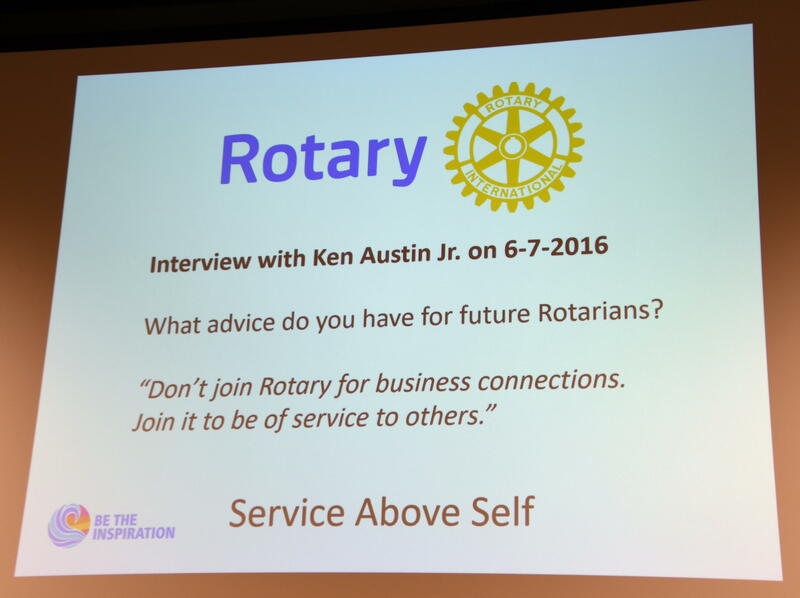 Attend YOUR Rotary Club meeting on the 17th at the Cultural Center and find out! 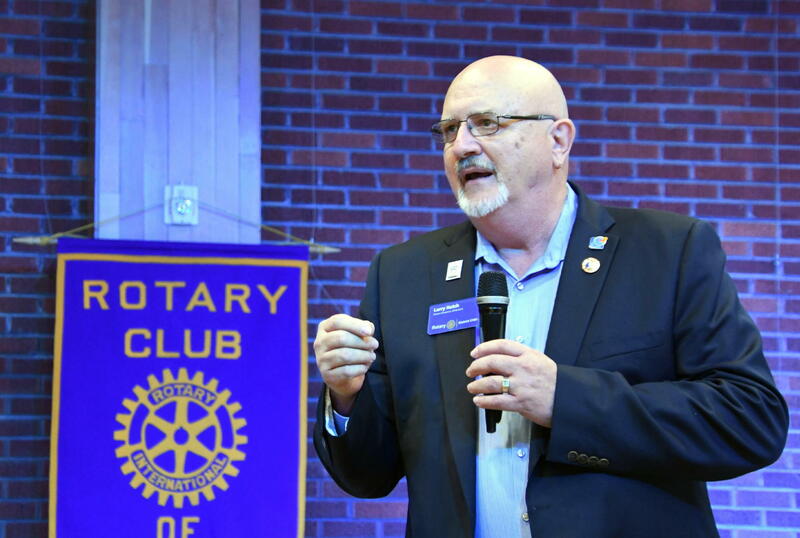 Then the meeting on the 24th will feature our 5100 District Governor, Larry Hatch…..DON’T MISS HIM! Learn about Rotary’s world-wide fight to end polio. In the Rose Room at the MODA Center, 1 N. Center Court Street, Portland, OR. October 18. Noon to 1:30. Joan Toone, polio survivor, shares the history of polio and progress toward eradication. 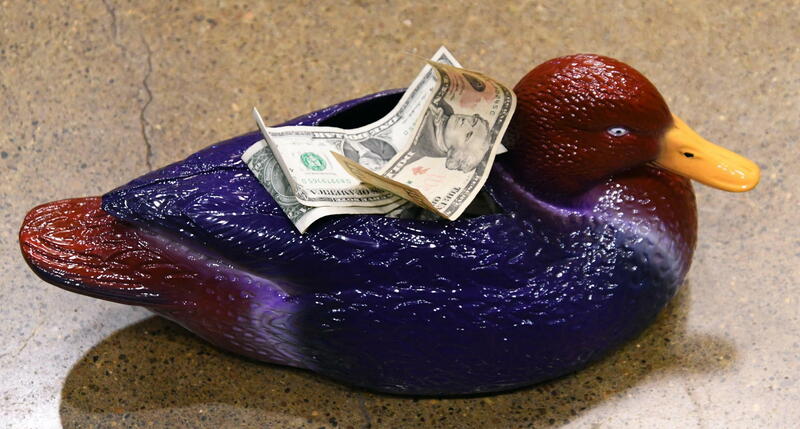 Denise Bacon “extracted” contributions to the DUCK this week…managing to collect generous $$$ contributions from several Rotarians present…for real or perceived “transgressions” and/or accomplishments. *Then….after several way-off-the-mark guesses by others…….the “Mystery Rotarian”… …was….hold your breath a little longer………Beth Pent! Who said that in the picture she was about 30′ up in a tree…and REALLY DID the “zip line” thing and had F U N …doing it! Thanks to Beth for the FUN new opportunity for some of the rest of us to contribute to the Club’s coffers! Auggie showed up with a decidedly PURPLE…flagrantly-labeled “Huskies” shirt….and paid for the privilege while “taunting” the competing Beaver fans present to also “cough up”…. Rebecca Piros presented our program, addressing the unique emotional/physical/cultural/logistical issues associated with being blind. 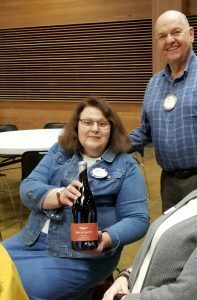 She was ably “assisted” by her husband, Gene, former Newberg Noon Rotarian, but now new “Friend of Rotary”. Today’s guest speaker was Rebecca Piros, who shared her experience of becoming blind 3 years ago and what it took to relearn everyday tasks and go back to work at Newberg High School. 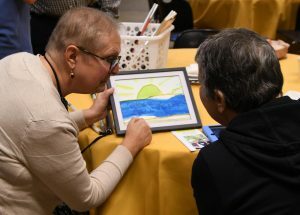 She was hospitalized 3 years ago with a rare fungal meningitis that caused her to lose most of her vision, only seeing blurred shapes and contrasts, no color or facial details or print. 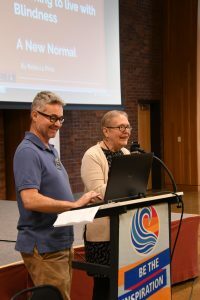 Through the aid of the Oregon Commission for the Blind, she learned how to function in daily tasks and computer skills to be able to return for a couple of hours a day to NHS to work in the attendance office. Attending blind camp at http://hullparkfortheblind.org, she has been able to experience new adventures such as kayaking, white water rafting and rock climbing as well as the company of other blind people. 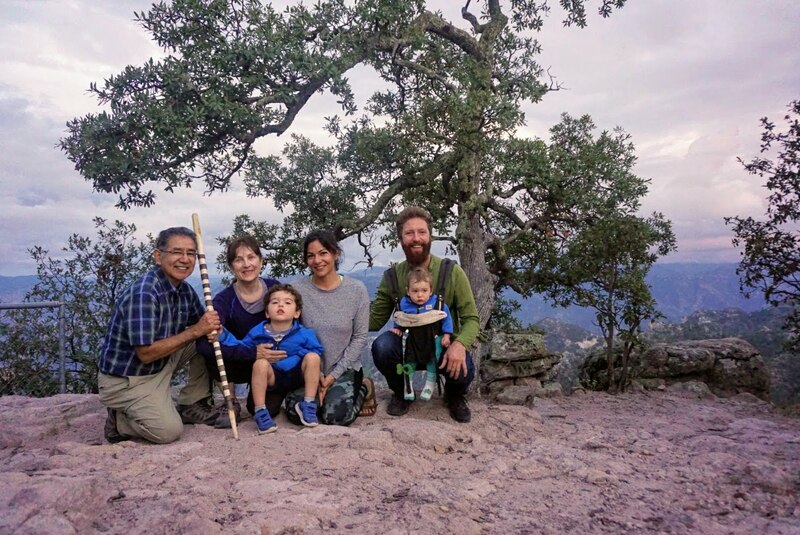 Her message of thankfulness for her family and friends and willing to get on trying and learning shows that life is still worth living even when you need to learn a new normal. Thank you, Rebecca and Gene, for a very interesting “insight”…if you will…on a challenging subject. 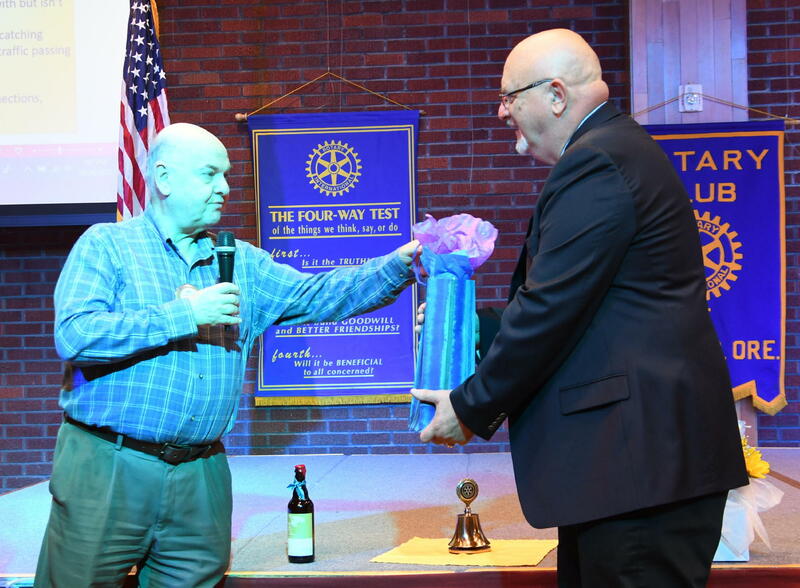 Rotarian Herbert Taylor – RI President, 1954-1955, introduced The FOUR-WAY TEST to Rotary. Paula Radich was today’s GREETER….Thanks to Paula! Club President, Om, wearing a GORGEOUS & COLORFUL shirt…opened today’s meeting per usual….with excitement and enthusiasm! Om says that the shirt is hand-made from a Northern Thailand hill tribe, and that she has had the shirt for a long time. 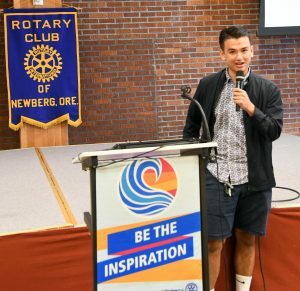 Guests of Judy Robinson today were several Newberg High School Interactors: Paris Boileau, Madison Baronne, Maddie Schneider, Lindsey Clark, Emma Gentry, Anixza Resendiz, and Sydney Hanson…Welcome all! 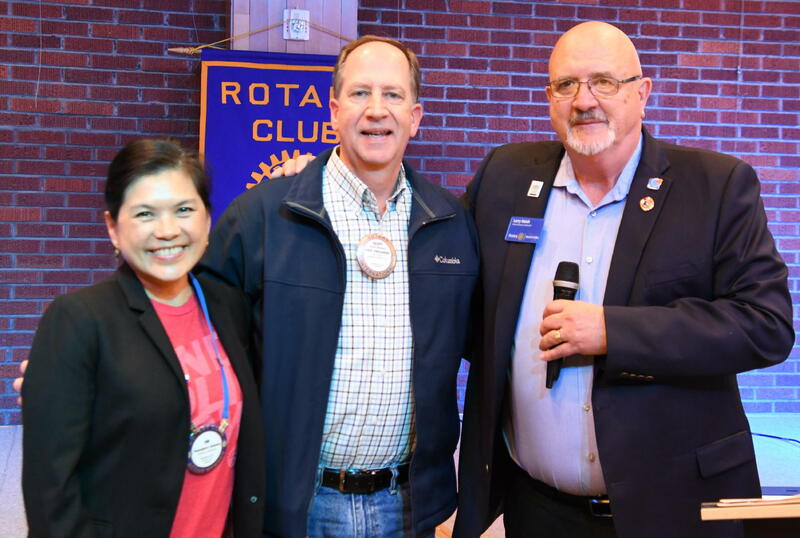 Jim McMaster’s Rotary Moment....announcing that there will be a “build” project at the Aquatic Center this Saturday, October 6…to assemble the new playground equipment that the two Newberg Rotary clubs have paid for! Join us in helping build a playground at the Pool Park from 8:00 a.m. to Noon. Jim McMaster promised to bring DONUTS! Please click on the link below to sign up! LATE NEWS FLASH! Several Newberg Noon Rotarians showed up for the “build” at the Aquatic Center/Pool Park ….and from the looks of these happy faces, the activity was a SUCCESS! And it appears that Walter was a”driving” force on the team…putting Jim in his place! 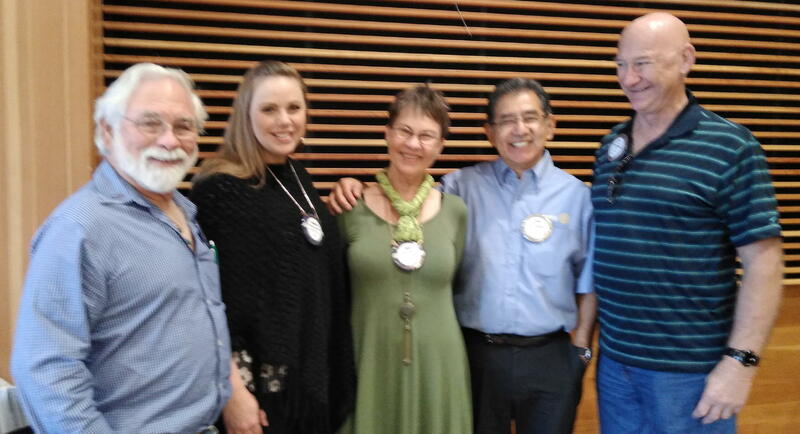 Ivan Estrada, was inducted as a new Rotarian today…sponsored by Shannon Buckmaster and Denise Bacon. Since neither of them were present, President Om officiated with Ivan’s induction. Ivan’s training and background are in Public Health. His hobbies and interests are hiking, backpacking, soccer, running cycling, disc golf, reading, cooking, etc. Youth develpoment is a personal passion, with a particualr interest in International Health Initiatives. 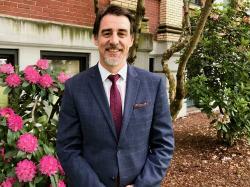 He currently is working with Yamhill County Public Health. We will learn more about Ivan as he presents his Classification Talk in the near future. Welcome, Ivan, to Newberg Noon Rotary Club! 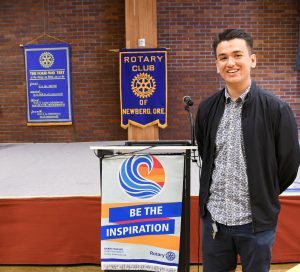 Help Ivan get into the Rotary “swing of things” and introduce yourselves, sit with him at lunch, and volunteer to assist him in any way to quickly become an integral part of our “extended Rotary family”! 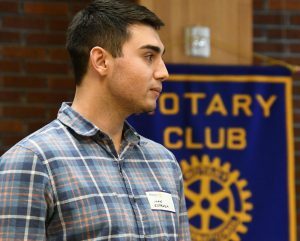 Jim McMaster gave a brief update on son Spencer’s travels in Africa as he begins his stint with the Peace Corps…We have not heard from Spencer this week. He is now in Eswatini which used to be Swaziland. He is in that country training. Paula reminded us of Ken Austin, Jr.’s, birthday celebration 7 – 8:30 AM at the Cultural Center on October 25. 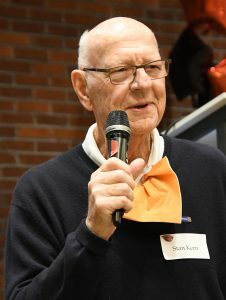 Ken is a Past President of our club and was a Charter Member of the Earlybirds. 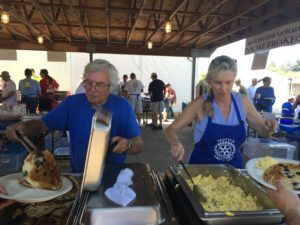 Another reminder…we can be a BIG HELP to the Earlybird Rotarians by including their two Exchange Students in our activities. Rosangela Ruiz Lopez and Matteo Crotta are both 16 years old. She is from Oaxaca, Mexico, and he is from Lake Como, Italy. REMEMBER…these YOUTH are our FUTURE ROTARIANS! SO GET INVOLVED! To get directly involved with these students’ exchange time in our community, contact Michelle at 503.476.5200. 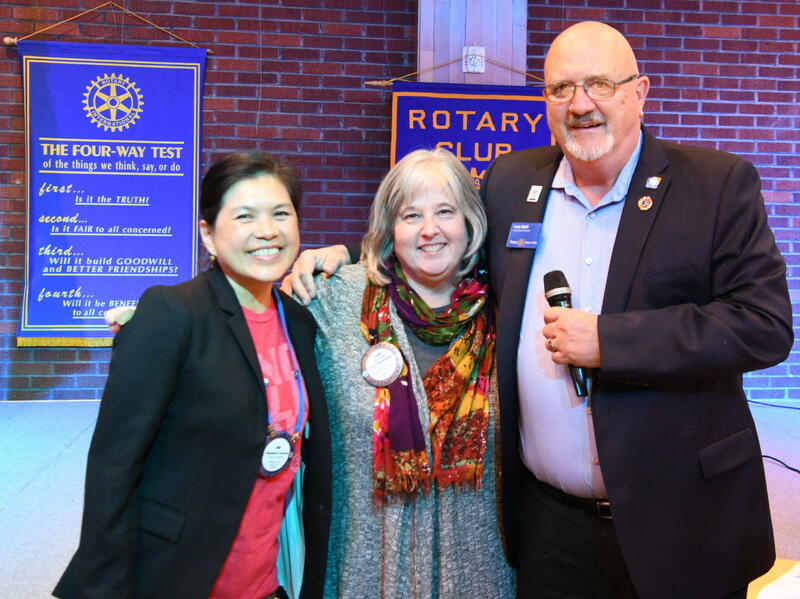 Learn about Rotary’s world-wide fight to end polio. 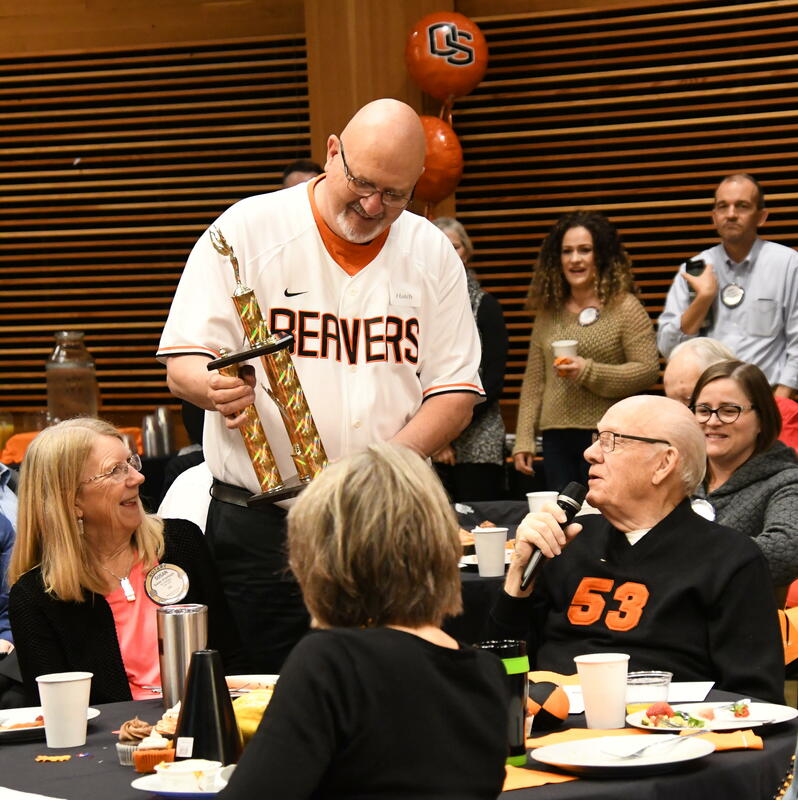 In the Rose Room at the MODA Center, 1 N. Center Court Street, Portland, OR, October 18. Noon to 1:30. Joan Toone, polio survivor, shares the history of polio and progress to eradicaiton. Jeff Lane handled the DUCK this week…managing to collect generous contributions from several Rotarians present…including…but not limited to…Auggie…..missing last week as he was in Mexico with his family and who had some excitement with his trip to the Copper Canyon….so…in his words…..
My wife, Maureen, and I planned a week-long family trip with our daughter Laura, her husband, Tobin and two grandsons, Logan (4yo) and Asher (16 mo.) thru Mexico’s Copper Canyon. The scenic Copper Canyon, in the Sierra Madres is three times as big as the Grand Canyon with a depth of 7,000 feet. 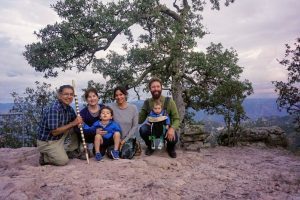 It is also the home of the Tarahumara Indians, renown for their long distance running ability. 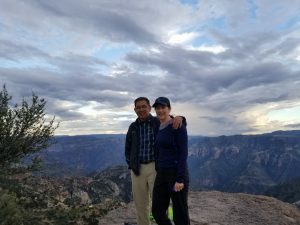 We flew to and met in Chihauhau, Mexico, (and surprisingly we saw only one Chihauhau!) 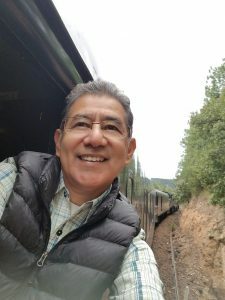 where we started our multi-city stop and tour of the Copper Canyon via the Chepe Express Train with panoramic views. We had short visits in the cities of Chihauhau, Creel, Divisadero, El Fuerte and ending in Los Mochis, approximately 350 kilometers (218 miles) from Central Mexico to the Gulf of California. We stayed several days in Divisadores where we experienced some of the most amazing views of the Copper Canyon. We had an opportunity to ride a Zip Line over part of the Copper Canyon, which was 2miles long and reached a speed of 85 miles per hour. For those faint of heart, there was another option of 7 shorter and slower Zip Lines. With the two little ones, we chose to take the scenic Tram ride across the canyon. It was an amazing trip. 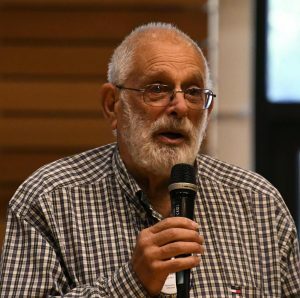 Walter Want spoke about the increasing evidence of a wide range of health issues appearing in veterans who had been exposed to Agent Orange to one degree or another during the Vietnam War. Corey was “suffering” from a guilt trip on having “spaced” on an information request from yours truly…the Editor….but we worked it out…. And others pungled up $$$ for real or perceived “transgressions” and/or accomplishments. 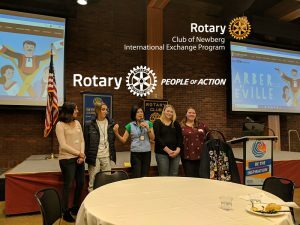 Part one: Judy Robinson introduced several Newberg High School [NHS] Interactors: Paris Boileau [President Om’s daughter!] , Madison Baronne, Maddie Schneider, Lindsey Clark, Emma Gentry, Anixza Resendiz, and Sydney Hanson. “We have just had our first 2 meetings. The elections will happen next week. So most of the time has been spent nominating officer candidates and just getting settled in. 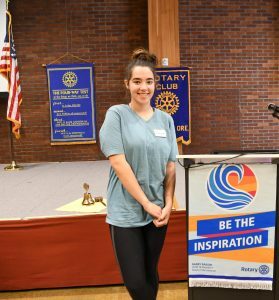 One member, Madison Baronne, will work on getting the Interact Club one page in the yearbook for NHS to enhance the exposure to the other school members and better promote Interact and Rotary. We will keep you posted as projects become more real…currently our membership is at almost 30. 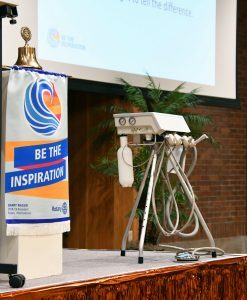 “ For her part, Madison read the “Four-Way Test of Rotary” to those present. Alexander enthusiastically shared with us his personal life story dealing with an autistic brother …Stefan …and what positive steps he has taken to do something about it. Alexander brought with him some of the product prototypes he and his team have developed to improve communication[s] with autistic individuals such as Stefan. 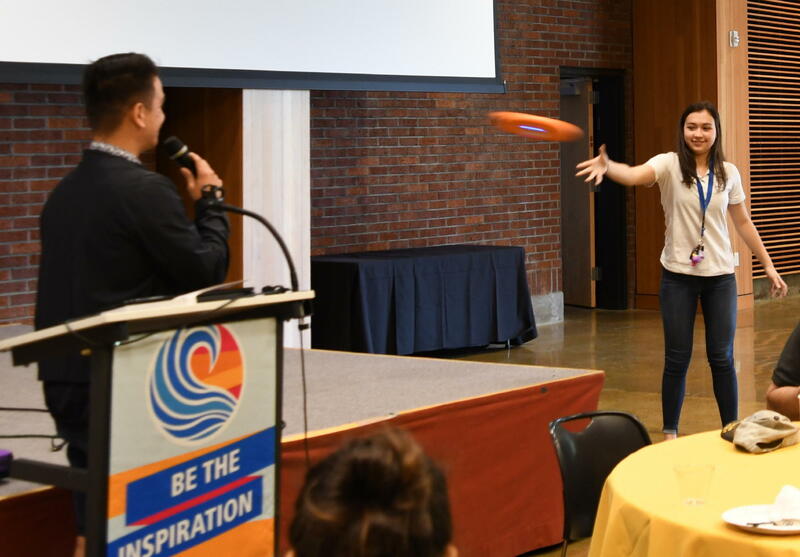 Among the devices was a “frisbee”- like tool/toy with an integrated speaker. 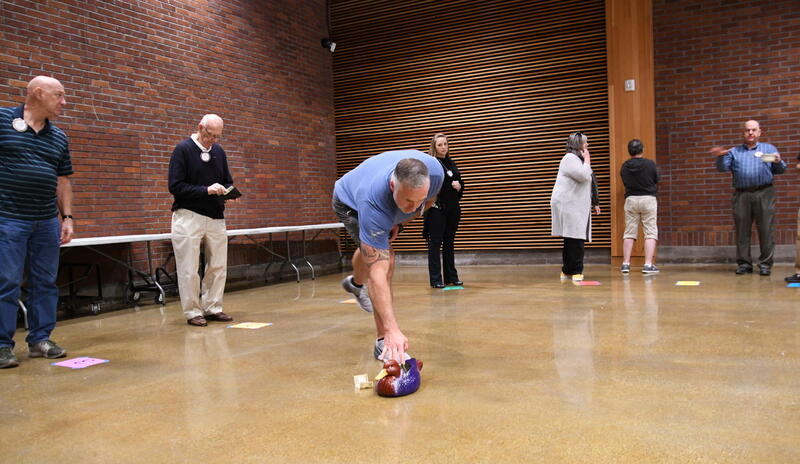 The natural tendency to catch it and throw it back opens up potential lines of communication between players. 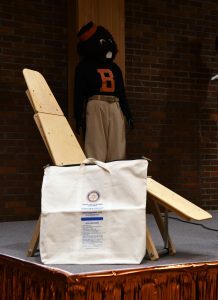 This was only one of several similar creations he presented & demonstrated. It was very obvious Alexander is very passionate about his current life quest. [*Autism, or autism spectrum disorder (ASD), refers to a broad range of conditions characterized by challenges with social skills, repetitive behaviors, speech and nonverbal communication. 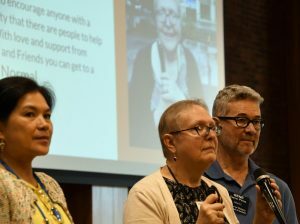 We now know that there is not one autism but many sub-types, and each person with autism can have unique strengths and challenges. Thanks to the Interactors and Alexander!